Welcome to the Wine Cellar- One of the private dining rooms in Hyatt's residential inspired Chinese restaurat- Li Li. I was lucky to be one of Li Li's guests for a Gongfu tea ceremony and luncheon feast wherein we were served with Li Li's best tasting dimsum favorites. Respect for the art of tea. Before we started the luncheon, we were served with some refreshments that only Hyatt offers. 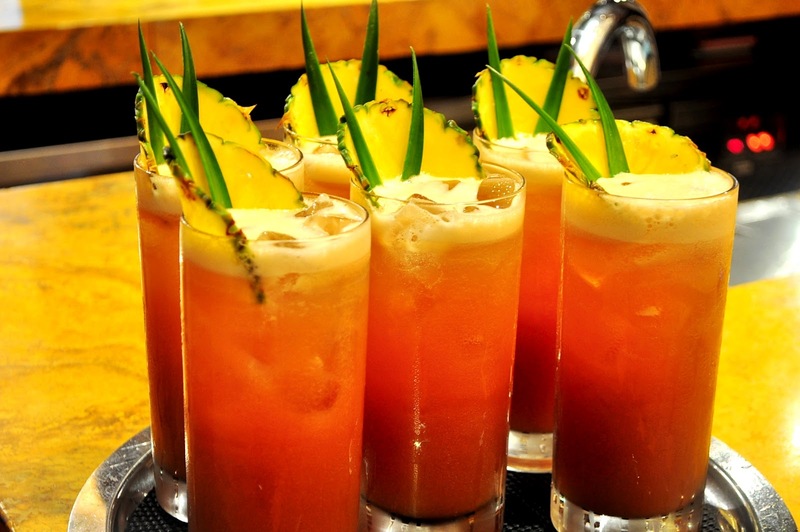 Their Signature Guava Iced Tea is something you should not miss during your stay in Hyatt Hotel. I must admit, it is definitely one of the best iced tea I've had. And to begin our dimsum feast, appetizers of peanuts and pickled veggies were served on the table. Our favorite Xiao Long Bao is made with tender pork and crab meat filling with a rich broth delicately wrapped inside a thin layer of coating. Biting a hole at the top part of the dumpling then putting a few drops of black vinegar with ginger would make the Xiao Long Bao tastier and more flavorful. One of my favorite deep fried dimsum is Taro Puff but seldom do I get to taste a really good one. Luckily, Li Li's version didn't fail me. It has the right amount of puffiness that I am looking for with generous amount of soft mashed taro and seafood filling inside. Definitely one of the best! A classic dimsum favorite which is a regular find in most Chinese restaurants' menu. Li Li's Siomai was big, chunky and meaty filled with pure pork and scallop goodness. How I wish every Chinese restaurants could make their siomai this good. A crowd favorite, Li Li's Hakao was plump with 3 big pieces of fresh shrimp enclosed in a clear translucent sheet of soft and chewy hakao wrapper. This plate of Lobster and Asparagus Dumpling was compliments of the Chef himself who graciously visited our table to give us a warm welcome. The presentation was really eye catching and for the taste.. even better. Simple as it is, these Pork Dumplings have pure meat fillings that will satisfy your dumpling cravings. It's also amazing that these dumplings were not that greasy given that they've been wok-fried. You may even think that they were steamed due to its soft and chewy wrapper. I am not a fan of bicho-bicho 'cause I find it too oily but Li Li's take on this deep fried doughnut proved otherwise. It wasn't that oily plus the shrimp pieces inside every piece was a perfect add on to the wasabi-mayo sauce drizzled on top. To cap off our dimsum feast are these beautiful glutinous balls coated with nuts and filled with melted white chocolate. A great meal ender, this soft glutinous ball got everything I love from mochi, to nuts, to white chocolate all rolled into one sweet satisfying dessert. Li Li offers their eat-all-you-can dimsum at a promo rate of P788 net per person and is available Mondays-Saturdays 12:00 noon to 3:00 pm. Sunday Yum Cha at Li Li starts at 11:30 am to 3:00 pm for only P1,550 net per person. 5/F Hyatt Hotel, 1588 Pedro Gil cor. Oh! Love them all... Katamtakam! Great presentations! Great reviews! Naku I love Dimsum! Will definitely try their buffet..lagot sa kin yang bicho bicho na yan..yum!!!! Though I might not be able to eat in such restaurant, I'm still hoping to, if given a chance! End your day with a delicious, energy-restoring meal. I just hit the gym this afternoon and loving this interesting post about your featured chinese restaurant. I go for dumplings! I'm terribly mesmerized of the foods here. Tea for the Chinese is a traditional symbol of showing their genuine hospitality. I thought it was just a common practice among them. Well, reality it is an art. Wow, those pics look awesome! Dumplings, dumplings and more dumplings. I so love dumplings! The one with chocolates and peanuts seems so yummy! Oh man!! I am certainly going to try this out with my brother SOON! Wow! Sarap! I just made some wanton at home. Nothing beat home-made; but these are really tempting. Wow sarap!!!! I gotta try this one too.... I am an avid fan of Asian Cuisine. I love tea ceremonies! I first experienced it in China. I was just enthralled at how meticulous they did all the pouring and changing of teacups. It does require patience though. :)) Oh, and that guava iced tea looks worth a try. I have never experienced a tea ceremony...and I did not know bicho-bicho was Chinese in origin. Now I do. Wow daming dumplings.. Guandong remins me of Princess and I ng ABS CBN.. I wonder if they're the same. Those looks really mouthwatering dishes. I've always love chinese foods. wow, very artistic. and the dimsum foods looks really delicious. This is absolutely mouth-watering. Your pictures actually work to convince. oh.. i miss siomai! i'm curious with the guava iced tea...sounds yummy! Sіmply want to say уοur artіcle is as аmazing. The сlearneѕs in youг рut up іs simρly cool and that і could think you're a professional in this subject. Well together with your permission let me to take hold of your RSS feed to stay updated with imminent post. Thanks a million and please carry on the rewarding work. I do not know whether it's just me or if perhaps everybody else encountering issues with your site. It appears as though some of the written text within your posts are running off the screen. Can someone else please comment and let me know if this is happening to them too? This might be a problem with my browser because I've had this happen before.